Italian club Lazio have been fined £120,000 by Uefa over the behaviour of their fans, including racist chanting, in Europa League games against Tottenham and Maribor. The incidents involving Spurs occurred during the 0-0 draw between the two sides in Rome on 22 November. Tottenham have been fined £8,570 for "crowd disturbances" during the same fixture. Uefa say appeals can be lodged against the verdicts within three days. After the November match, Spurs boss Andre Villas-Boas said Uefa "had to act" over chants from the crowd. Spurs, the Football Association and Lazio all strongly condemned the fans, who allegedly chanted anti-Semitic songs during the game, 24 hours after a knife attack on Tottenham fans in the Italian capital. 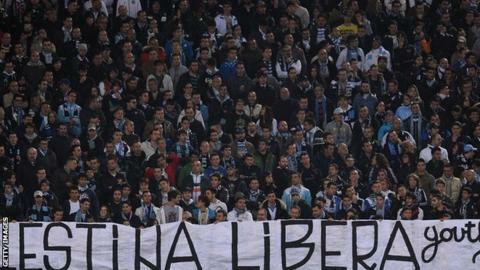 A portion of the Lazio fine also relates to "racist conduct of their supporters, ignition of fireworks and incidents of a non-sporting nature" during the game against Maribor in Slovenia on 6 December. Maribor have been fined £14,580 for "insufficient match organisation" and the throwing of missiles or fireworks by their supporters at the same game. In October, Lazio were fined £32,500 following racist chanting at White Hart Lane in September, when Tottenham trio Jermain Defoe, Aaron Lennon and Andros Townsend were reportedly subjected to monkey chants.